Photos by Sean Koo/@scoobykoo who wants me to add Spoiler Alert! 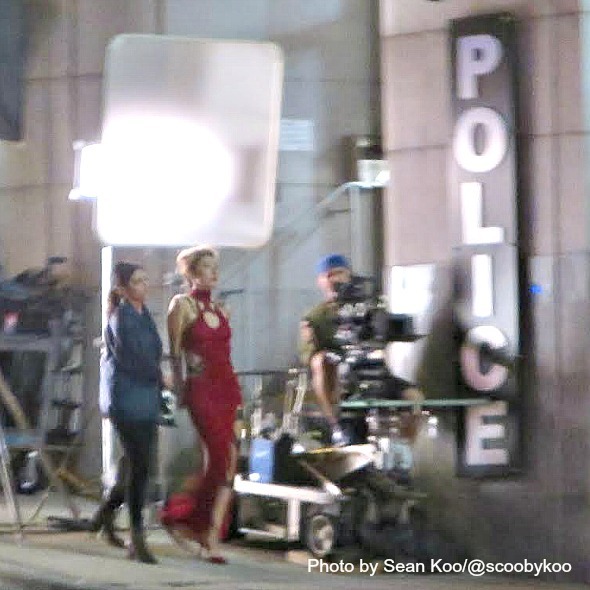 Supergirl has a new femme fatale villain played by Dichen Lachman in a long red dress with a side split to show off her snake tattoo. Is this Roulette? Update: The gambling supervillain is running an underground alien fight club according to ComicBook.com and wants Supergirl in the ring. 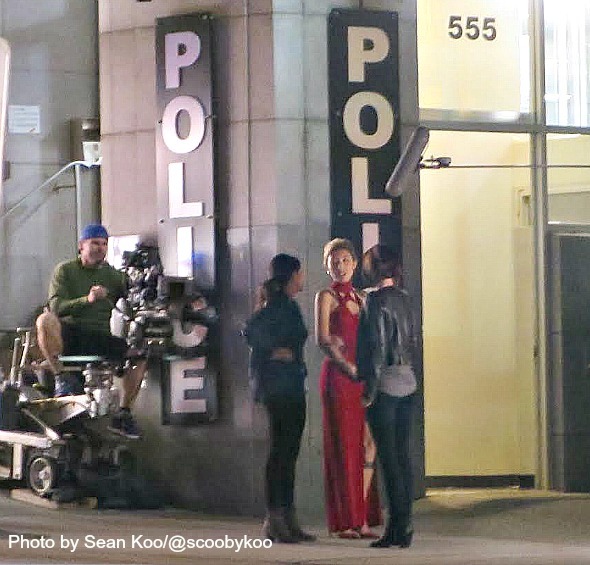 Supergirl’s overnight shoot had the sequence of science police officer Maggie Sawyer (Floriana Lima) escorting the new villain and meeting up with Kara’s sister Alex (Chyler Leigh) from the DEO (Department of Extra-Terrestrial Operations) on the corner. Filmed overnight last night at the New Westminster Police Station there is no context for this yet, but it might have something to do with the event Supergirl is setting up the Vancouver Public Library atrium for tonight. James “Bam Bam” Bamford is directing episode 4 of season 2. Which makes sense with an alien fight club — Bamford was Arrow’s fight designer and stunt coordinator before adding directer to his repertoire. Last day here! It's been a wonderful experience guys…….thanks guys! !